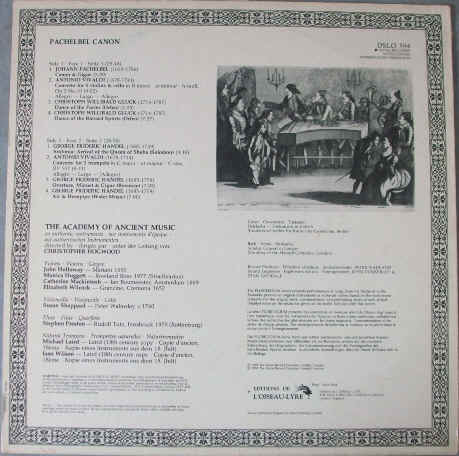 33rpm LP Record featuring the Academy of Ancient Music directed by Christopher Hogwood. Issued in 1981 on the purple Editions de L'Oiseau-Lyre label. Includes 2-page booklet. 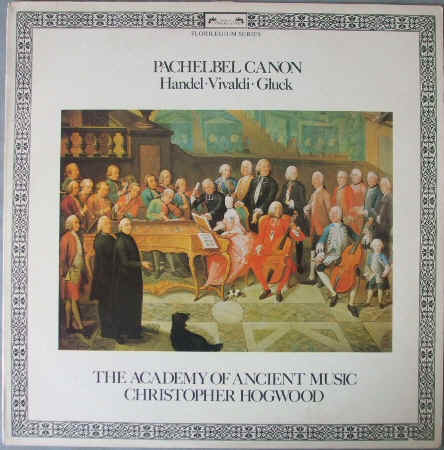 33rpm LP Record of DSLO 594 PACHELBEL CANON HANDEL VIVALDI GLUCK, featuring the Academy of Ancient Music directed by Christopher Hogwood. It was issued in 1981 on the purple Editions de L'Oiseau-Lyre label, part of the DECCA group. The musicians are: John Holloway, Barry Guy, Susan Sheppard, Monica Huggett, Micaela Comberti and Christopher Hogwood. Includes 2-page booklet with short background notes in English, French and German. The record itself is in excellent condition, with no major scratches/marks that I can see. Very good sound quality, with NO jumps, or excessive crackle, and only a few light ticks here and there (around 20-25 in all). Otherwise near faultless playback. Minimal to no spindle wear. Labels very clean, no discernible spider marks. The outer sleeve and original DECCA inner sleeve are in very good condition, with light ring marks on the back cover, a half-inch area of excessive rubbing along the top edge, light bumping to corners and light spotting to the inner sleeve. The booklet has some light spotting, but nothing major.